Από τις 22 Δεκεμβρίου έως τις 10 Μαρτίου το Μουσείο Σύγχρονης Τέχνης Κρήτης και η KOLEKTIV8 διοργανώνουν την έκθεση Critical Archives III: Identities, στo πλαίσιο του 2ου Μεσογειακού Φεστιβάλ Φωτογραφίας, σε επιμέλεια Μαρίας Μαραγκού, Παύλου Φυσάκη, Δημήτρη Κεχρή και Γιώργου Καραηλία. Η έκθεση Critical Archives III: Identities προτείνει ένα εναλλακτικό πολυκειμενικό διενέργημα, στο οποίο εμπλέκονται τα ίδια τα έργα και η κειμενική τους πλαισίωση, η διαδρομή τους μέσα στο χρόνο, οι καλλιτέχνες και ο λόγος τους, η «γυμνή» παρουσίαση των φωτογραφιών χωρίς κάδρο, τα ποικίλα εκφραστικά μέσα, η συσχέτιση της εικόνας με το βιβλίο ως πλαίσιο παρατήρησής της, όλα συστατικά στοιχεία ενός νέου ενιαίου έργου, υπό το πρίσμα ενός συλλογικού καλλιτεχνικού πειράματος. 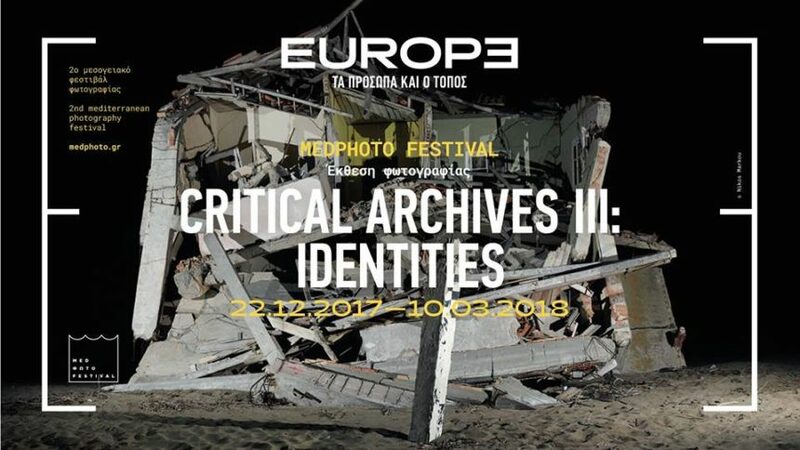 Critical Archives III: Identities, the main exhibition of MedPhoto Festival 2017-2018, takes place at the Museum of Contemporary Art of Crete, from December 22th until March 10th. MedPhoto Festival hosts a mosaic of photographic projects from or about Europe that depict the old and the new face of people in Europe and capture European societies in this process of transformation. The identities constructed within this continent, deeply influenced by the rapid changes in beliefs and practices on the level of gender, interpersonal, social and political relations, as well as a critical understanding of the territory, with all the hues and meanings this entity carries, are the focal point of this exhibition. Julián Barón, Lewis Bush, Turi Calafato, Federico Clavarino, Giovanna Del Sarto, Rineke Dijkstra, Gerasimos Domenikos, Petros Efstathiadis, Çağdaş Erdoğan, Thalia Galanopoulou, George Georgiou, Jim Goldberg, Paul Graham, Robin Hammond, Nick Hannes, Jovana Hasimi, Alessandro Imbriaco, Yannis Karpouzis, Demetris Koilalous, Charalambos Kydonakis, Georgios Makkas, Nikos Markou, Mari Masouridou, Davide Monteleone, Simon Norfolk, Stefania Orfanidou, Nikos Pilos, Mark Power, Georges Salameh, Jérôme Sessini, Kosmas Stathopoulos, Daphne Tolis, Ania Vouloudi. The exhibition presents a multi-textual project as a collective artistic experiment. Frameless pictures are met within their textuality and their existence through time; the artists are met along with their own words and the words of their subjects; the image is correlated with the book as a primary frame of reference in photography. All the above are the components of a new, cohesive work, in an attempt to question the exclusion processes and the territorialized anchoring of constructing an identity. A work in search of the ground where multiple, pluralistic identities are formed inside the cumulative personal and collective experience and existent social relations.